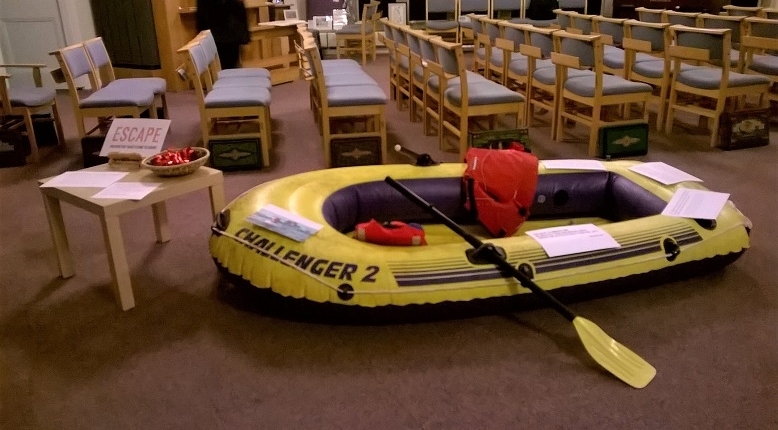 In early 2016, when many in the UK were moved by the news of increased numbers of people fleeing to Europe, Reverend Ben Kautzer, at St Nicolas Church, Earley, prepared a Service of Prayer and Holy Communion for Refugees entitled “Into Deep and Turbulent Waters”. 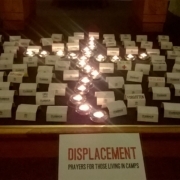 It included a eucharistic liturgy, Bible readings, prayers and four prayer stations relating to the refugees’ journey. The evening proved to be a powerful way of engaging the congregation with the topic of refugees and forced migration. Whilst some things have changed in the refugee situation since then, the issues facing refugees remain. Worldwide there continue to be millions who flee their homes and undertake perilous journeys in search of refuge, including in Europe. 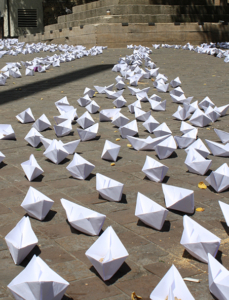 It is as important as ever for Christians to heed the call to prayer and action for refugees. We are sharing these materials with Ben’s permission, to make it easy for you to hold a similar service, or time of reflection, in your church. With the original resources, we are showing how two different events used them in particular contexts. If you do use Ben’s materials, please do give him credit. At the start of the service the following slides, clarifying definitions and statistics, were shown: Intro slides – DBC refugee focus prayer service 02.12.18. 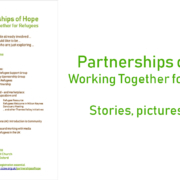 To highlight that refugees are individuals with their own stories and to encourage empathy, a short extract (the first 3 minutes 53 seconds) of the Jesuit Refugee Service video was shown. Each prayer station consisted of a screen/board with a table and a few chairs in front. 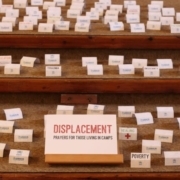 The prayer instructions and materials for each were slightly adapted, including incorporating words relating to the refugee experience at each stage Words for each prayer station. For the “Escape” station, having neither enough space nor a dinghy, we instead used photos of refugees fleeing by boat and on foot. The “Displacement” model refugee camp was made from just 20 tents, each with a word on, accompanied by photos of the Za’atri refugee camp in Jordan. We added a 5th prayer station “Healing” with a wooden cross and candle – Healing – DBC Prayer Instructions. The “Peace” prayer station highlighted the top five countries of origin of refugees in the world today Top five countries of origin – World Vision and people could add to the map a prayer or the name of a country on their heart, using sticky notes. 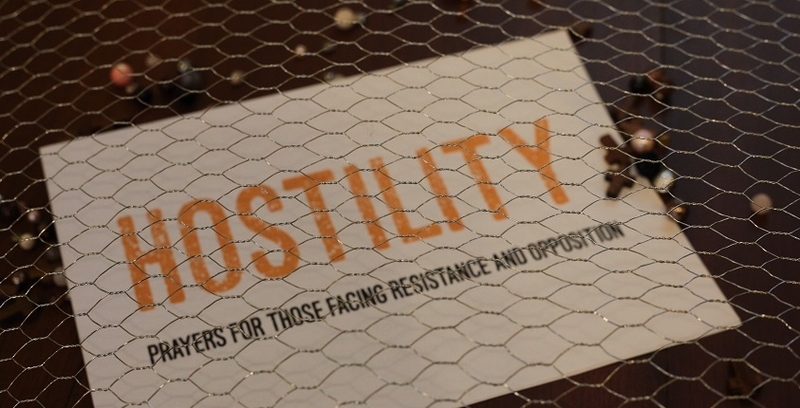 CCOW offered a morning for prayer and reflection using Ben Kautzer’s four prayer stations and an additional one, ‘Hostility’. A group of about 15 people took part in opening worship, and then made a pilgrimage around the stations. 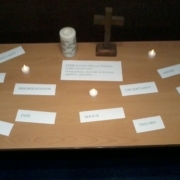 As we reached each prayer station, we listened to stories and readings relating to the station’s theme; after people spent time at each prayer station, there was an opportunity to share reflections and pray. We ended with closing prayers, gathered once again around the ‘Escape’ station. The whole took a little over 2 hours – and was followed by a simple shared lunch. Additional materials prepared by CCOW are below. Whether you’re already involved in supporting refugees, would like to be or are just exploring, this event organised by Christian Concern for One World is for you. 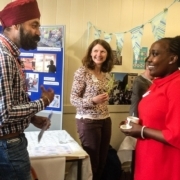 A range of groups and organisations from across the Thames Valley will be participating in a programme which will include speakers, workshops on topics such as community sponsorship and working with the media, and stalls. It’s a great opportunity for information, networking and encouragement. Free to attend, £5 with lunch. Registration essential – go to www.ccow.org.uk/events/partnerships-of-hope. 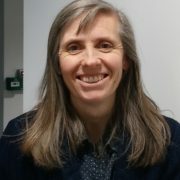 For further information please contact Joanna Schüder, CCOW’s Refugee Networking Officer on joanna@ccow.org.ukor 07823 686568.
in collaboration with Churches Together in Marlow and Churches Together in Maidenhead has an initiative, reported in the local press, to encourage volunteers to help refugees in Calais over the period of Lent by serving in the kitchens and warehouse there for a few days. 22 people have signed up so far. Following an agreement between the UK and French governments at the end of January unaccompanied refugee children who arrived in Europe between March 2016 and January 2018 will now also be eligible to come to the UK under the Dubs scheme. After eighteen months of considering evidence the Home Affairs Select Committee recently published its report Immigration policy: basis for building consensus. 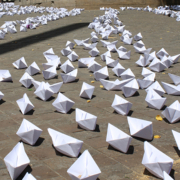 It recommends that the government proactively challenge myths and inaccuracies about immigration, honour its commitments to unaccompanied child refugees and establish a permanent Vulnerable Persons Resettlement Scheme. City of Sanctuary has produced an excellent information pack designed to help people understand the journeys that refugees and asylum seekers have been through that put pressure on their mental health. It includes advice and resources for helping refugees with mental health problems. Oxfam and the Refugee Council have published a new report “Safe but not Settled: The Impact of Family Separation on Refugees in the UK”. It calls for the government to expand the qualification criteria for family reunion. If you missed the recent screenings of this powerful documentary on global migration and would like to show it at a church, school or group you can register your interest with the producers.